"A painter is an image maker. That's it. Putting down the spirit of what you see. So why do we paint? Because we must. Because we want to. The silence, the space, the color. The life force of something pushing the land up and the solar system and the seasons that have eroded it. God, it's a language. You look at it, and you have to put something down to show how you feel about it. Why do you paint? Because you feel. Feeling itself becomes a sort of monastic study. It's not religion; it's part of what religions were formed from. It's the feeling that at 91 -- God, it's good to be alive!" Ray Strong, founding member of The Oak Group, painted in the realist landscape tradition throughout the 20th century, years when Modernism was ascendant. Ray arrived in Santa Barbara in 1960 to begin a three-year project to paint nine dioramas for the Bird Hall at the Santa Barbara Museum of History. He added a great spark to the Santa Barbara arts community, co-founding the Santa Barbara Arts Institute in 1965, Gallery 113 in 1973, and The Oak Group in 1986. Ray was born in 1905 in Corvallis, Oregon. He began painting at age eight, and at nineteen moved first to San Francisco to study at the California Society of the Fine Arts, then to New York City to study at the Art Students League. Returning to the West Coast in the 1930s he founded the San Francisco Arts Students League with fellow artists Frank Van Sloan, George Post, and Maynard Dixon. Ray documented the building of the Golden Gate Bridge in paintings that hang in the National Gallery of American Art in Washington, D.C. He painted dioramas for the San Diego Expo of 1935, for the U.S. Forest Service and National Park Service, for the University of California and the Academy of Sciences in San Francisco, and for the Museums of Natural History in Morro Bay and Santa Barbara—surpassing, from an artistic standpoint, any in the American Museum of Natural History in New York City. His greatest contribution, however, was to paint, and to teach painting, from life. As a born teacher and mentor, Ray had a way of experiencing the land, not just viewing it. His landscape paintings are never generic. Each represents a specific time and place and shows a particular geologic structure, watershed, vegetation, and quality of light reflecting the season and time of day. Ray mentored two generations of artists who otherwise would have been overshadowed by modernism, abstract expressionism, and conceptual art. His vision has been passed on to the current generation of landscape painters: observational painting is again considered “real art." 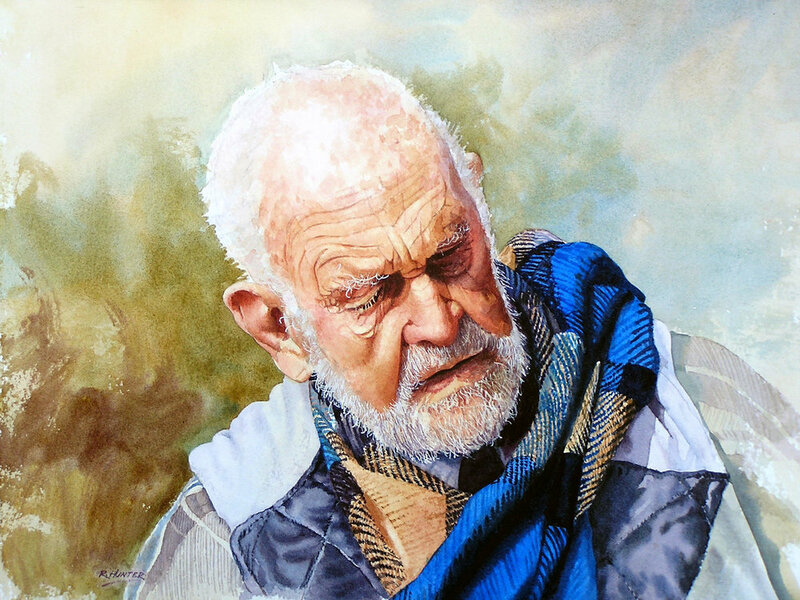 In 1986 Ray led a group of outdoor painters to a bluff overlooking the Pacific Ocean. When they discovered that the area they were painting was slated for development, the group decided to publicize the disappearance of another piece of precious open space by giving a show of their paintings. Thus was born The Oak Group. With around 100 exhibitions now under their belt, The Oak Group has helped to preserve in fact, as well as on canvas, the land they paint. The spirit of Ray Strong lives in every painting they create and every piece of land they preserve.